FORT WAYNE, Ind. (CNS) — The new culture of communication requires that Catholic media rethink their approach, the president of the Pontifical Council for Social Communications told a Fort Wayne audience gathered to celebrate the centennial of Our Sunday Visitor. Archbishop Claudio Celli spoke about the Catholic Church’s focus on new evangelization and addressed new media and the communications revolution that has created a vast cultural transformation in the past 25 years, as well as the place Catholic communications must have in the digital world. 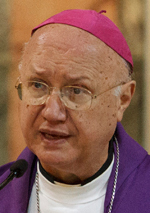 “We must not think of it as a ‘virtual’ space which is somehow less important than the real world,” Archbishop Celli said. Archbishop Celli spoke at a dinner Sept. 28 that followed a special Mass of thanksgiving and rededication at the Cathedral of Immaculate Conception in Fort Wayne, celebrated by Bishop Kevin C. Rhoades of Fort Wayne-South Bend, who is the chairman of the board of directors of Our Sunday Visitor, based in Huntington, which is in the diocese. Earlier in the day, the bishop opened a symposium at the Grand Wayne Center that drew Our Sunday Visitor staff and board members, area laity and priests, and bishops from the Fort Wayne-South Bend Diocese and around the nation. The day’s events were part of a celebration marking the 100th year of the founding of Our Sunday Visitor by Archbishop John F. Noll. “We need to be more attentive to our vocabulary. Much of our religious and ecclesial language is unintelligible even to believers. Many of our religious icons and symbols need to be explained for our contemporaries,” he added. He pointed out that no one needed a degree in theology to understand the writings of Archbishop Noll. One of the critical motives for the foundation of Our Sunday Visitor, the Vatican official noted, was a desire to defend the church from unjust attacks. “As Catholics, we need never hesitate to express ourselves forcibly, to correct error and condemn injustices, but we must always speak the truth in love,” he said. Moderated by Msgr. Owen Campion, associate publisher of Our Sunday Visitor and editor of The Priest, the symposium featured talks by: Cardinal Francis E. George of Chicago, attorney Helen Alvare and author Scott Hahn. The cardinal spoke of the challenges between scientism and fundamentalism and called for the need for a new Catholic apologetics. When dialoging with others, the cardinal encouraged a loving, humble and respectful response, even toward enemies of the Catholic Church. Alvare, associate professor of law at George Mason University School of Law, followed the cardinal with her talk on “Women, the Federal Government and Religious Freedom.” She focused on government threats to religious freedom, such as the federal health care law’s contraceptive mandate. She said she was confident seeking recourse through the U.S. courts and the Constitution would ultimately protect religious freedom from current threats. “Now is a moment in time to have this conversation,” she said. Hahn, who is a professor of theology and Scripture at the Franciscan University of Steubenville, Ohio, spoke on the “Bible, Eucharist and the New Evangelization.” He said evangelization should be based in the Eucharist and added that Catholics proclaim a eucharistic Christ. “The church evangelizes every time we celebrate the Eucharist,” he said. Retired Bishop John M. D’Arcy of Fort Wayne-South Bend was among those who gathered for the anniversary celebration. One thing essential to the priesthood “is to celebrate the Eucharist and to provide the sacraments to people,” said Msgr. Campion, who was master of ceremonies for the anniversary celebration. Johnson is editor and Cozad and Weber are also on the staff of Today’s Catholic, newspaper of the Fort Wayne-South Bend Diocese.